Conor Clancy and Cathal Mahoney with the Humphrey kelleher cup after the munster final last week. Well done to Conor Clancy, son of Jimmy and Ann Clancy Ballylusky and Cathal Mahoney, son of Tom and Mary Mahoney Shanakyle who were part of the tipperary U-15 football panel which won the munster football title (Humphrey Kelleher tournament) in great style beating Corks Rebel Og on a scoreline of Tipperary 3-12 Cork 1-07. Other results were Quarter Final Tipp 1-08 South Kerry 0-10, Semi Final Tipp 2-07 Cork 0-09. 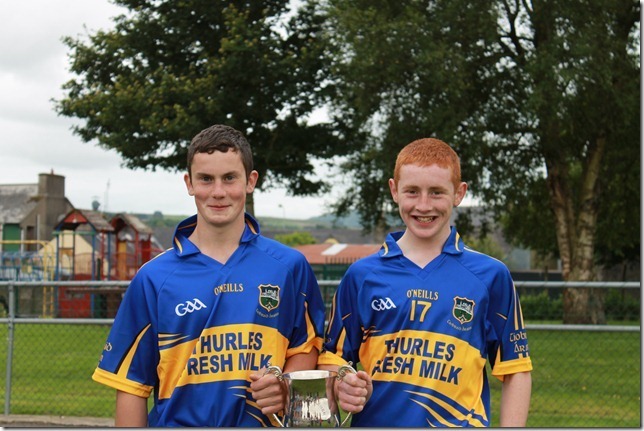 Conor and Cathal are no strangers to munster medals as they both won munster medals at U-14 level last year in both hurling and football. The St. Patrick’s club is very proud to see two of it’s most promising young players make tipperary county teams in both hurling and football and hopefully we’ll see lots more of the two lads in the blue and gold in the future. This entry was posted on July 25, 2012 at 4:42 pm and is filed under Football. You can follow any responses to this entry through the RSS 2.0 feed. You can leave a response, or trackback from your own site.